Tiffany's Online Finds and Deals: $15.99 for Enkeeo 2-in-1 Mosquito Killer Camping Lantern! $15.99 for Enkeeo 2-in-1 Mosquito Killer Camping Lantern! Would be great for camping, hammocks, ect! 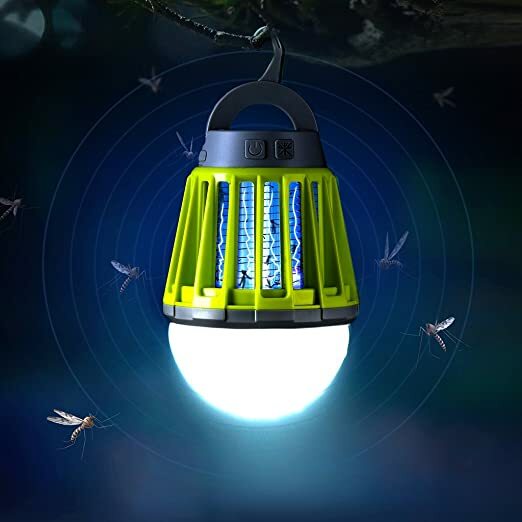 The zapper lantern effectively kill mosquitoes and other biting insects by creating a 16 x 16 foot zone of protection for bug-free comfort. It can be cleaned with running tap water because it’s highly waterproof (IPX6 rate), making it much cleaner and safer than its chemical counterparts. Thanks to the cordless design and its light weight of only 0.44 pound, the camping lantern can be easily carried with you when you’re outdoors. The built-in 2000mAh battery and power-saving circuit ensure you a long time use. The camping lantern has 3 different lighting modes, providing you 3 different brightness. A removable lampshade offers you soft/non-soft light. It is designed to be put in both ways. You can hang it up on a string or a tree branch, or you can put it upside down like a ground lamp.